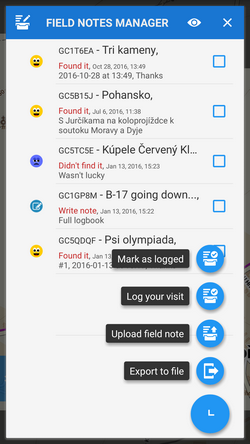 Logs manager - Locus Map can log your geocaches offline in drafts (field notes) that can be logged online later. This is the place where the drafts (field notes) can be simply managed, e.g. exported in a file or logged in Geocaching.com website. 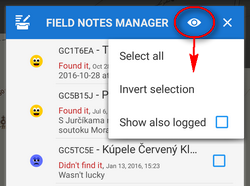 For advanced geocachers who want to filter, sort or batch-edit drafts we strongly recommend the FieldNotes Add-on. 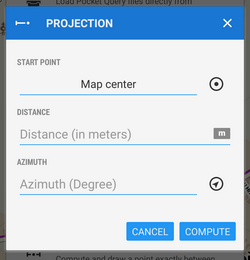 Projection - calculates a new point from its distance and azimuth from your location and draws it on the map. 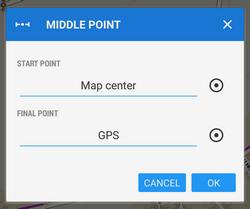 This function is available also in Location selector. 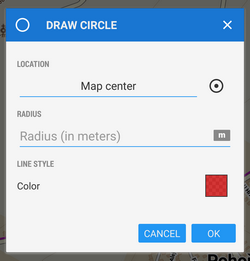 Cache radius limit - according to Geocaching.com rules, physical parts of individual geocaches may be placed at least 528ft/161m from each other. 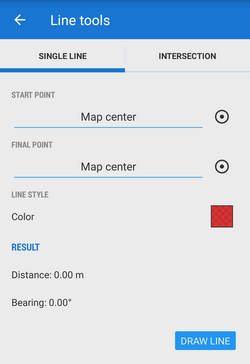 This function helps visualize such area. 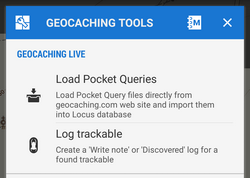 Locus asks which geocaches you want to highlight and offers your folder structure. if you just want to download images that are included in cache listings do not check Live API. It is also much faster. if you need also spoilers or you are not sure if listings are complete or contain links to all images, use Live API. This action requires valid Geocaching Live login. 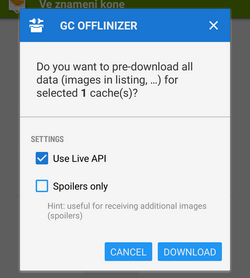 if you just want to download spoilers, you have to use Live API and check Only spoilers. It is recommended to clear unused images (that remain in your phone memory when you delete caches from Locus database) from time to time. 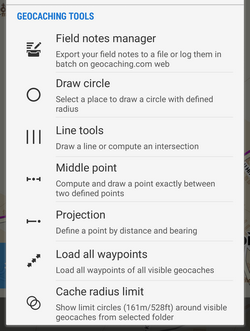 Go to Settings > Miscellaneous > Clear temporary data and select Unneeded geocaching data or Unused attachments.